Best Sleep Ever!!! 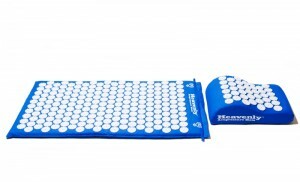 I Love the Heavenly acupressure mat! It looked more like a torture device than a relaxation aid. After reading the instructions, I used the mat with a t-shirt on but did not feel much, so off came the shirt and WHOA! – this mat would take some getting used to. The first sensation was pretty intense, but after reading instructions and reviews, got on the mat again and breathed through the first 5 minutes on the mat with bare skin. After about 10 minutes, my body got used the sensation and soon after, I was fast asleep. I woke up about an hour later when I shifted position in my sleep, still on the mat. Gently rolled off the mat and tossed it to the floor and continued sleeping. Had the best sleep I have had in a long time. After using the mat every day for a week, laying on the mat is now easy and my body is so used the sensation of the spikes against my skin that it is like slipping into a hot bath – I now look forward to it. My sleep has improved dramatically and I feel so much more alert and relaxed during the day. My whole body feels relaxed during the day. Muscles feel like I just got out of a hot tub or just got a massage. Absolutely amazing. Very glad I pushed past the first hesitation and discomfort that was felt when first on the acupressure mat. Recommending it to everyone I know and will be getting quite a few acupressure mats as Christmas gifts this year!